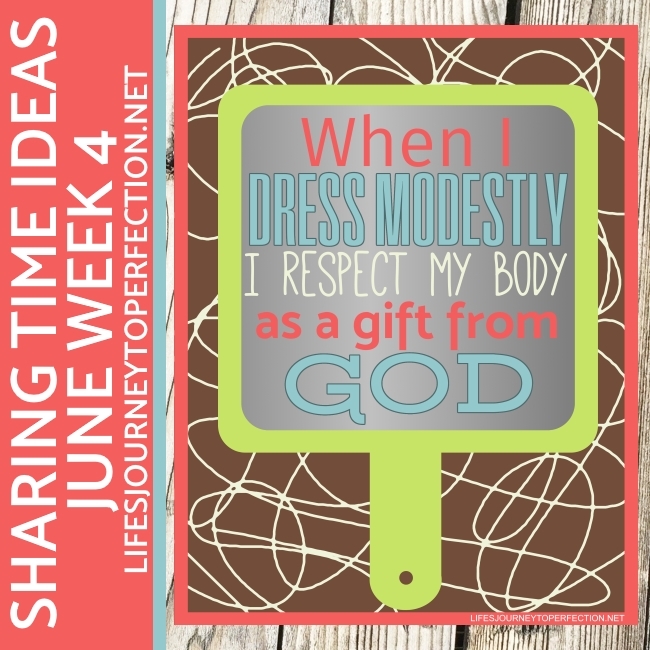 Life's Journey To Perfection: 2017 LDS Sharing Time Ideas for June Week 4: When I dress modestly, I respect my body as a gift from God. June Week 4 Topic: When I dress modestly, I respect my body as a gift from God. 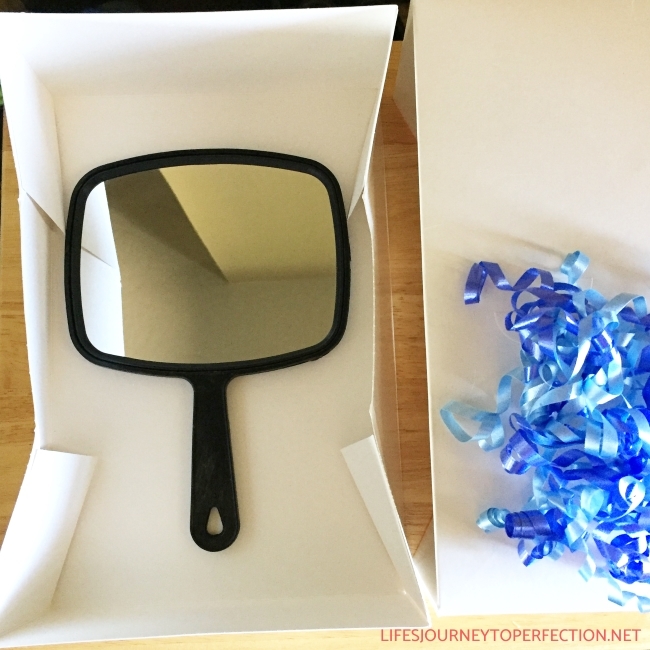 To begin Sharing Time show the primary children a gift box, inside the gift box have a mirror. Explain to the primary children that inside of the box is a very precious gift. It is a precious gift that our Heavenly Father has given us. Invite a primary child to come up and open the box and look inside. Invite the primary child to explain to the rest of the primary why that gift is. Pass the box around to the rest of the primary children and invite them to look inside. While they are passing the box around, explain that our bodies are precious gifts given to us from our Heavenly Father. They allow us to become a little bit more like our Father in Heaven. Which is something we greatly wanted before coming to this earth. Our bodies are the homes to our spirits and together with our spirits make our soul. They are so precious that the Savior has paid the price of death and resurrection so one day our bodies and spirits will be reunited and made perfect, never to be separated. With such a precious gift we should show respect to our bodies. 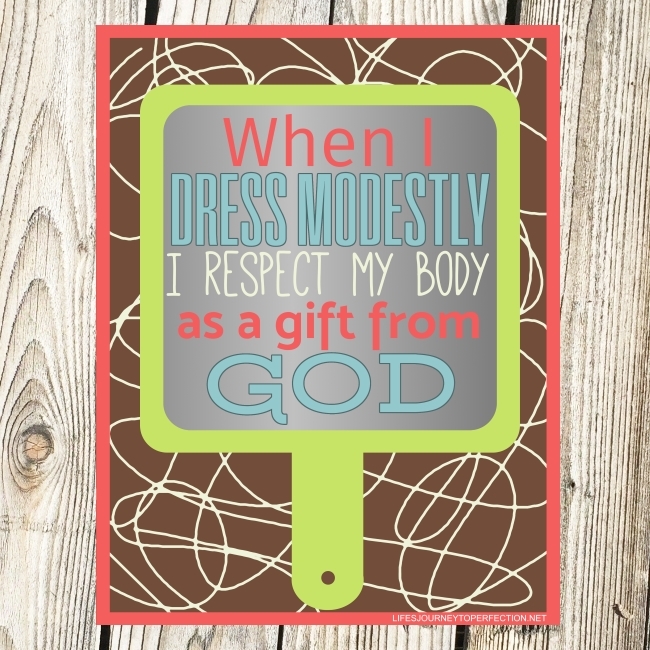 Invite the primary children to read the week's theme poster, "When I dress modestly, I respect my body as a gift from God." Explain that modesty shows that we respect our body. Invite the primary children to sing, "The Lord Gave me a Temple"
Explain to the primary children that Heavenly Father has given us some guidelines of how to dress modestly. These guidelines can be found in the For The Strength of Youth Pamphlet and help us show respect to our bodies and love to our Heavenly Father for giving us our bodies. On each of the items place the coordinating quotes. See below. 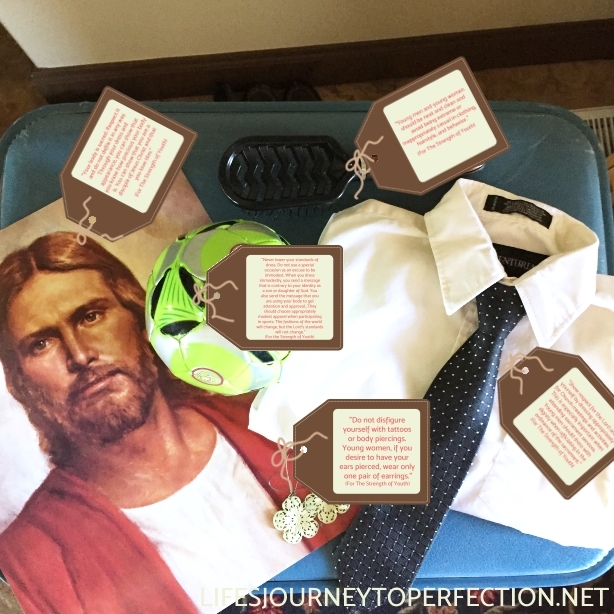 Explain to the primary children that in our suitcase are items that are going to help us make the right choices when it comes to dressing modestly and showing respect for this precious gift our Heavenly Father has given us. Close by expressing your love for the primary children and the love that our Heavenly Father has for them, as well as your testimony about respecting our bodies. 2017 LDS Sharing Time Ideas for June Week 3: I obey the Word of Wisdom by eating and drinking that which is good and avoiding that which is bad. Thank you very much! I like this idea a lot! This file will not print for me. It says it's in View Only Form. Am I doing something wrong? I would love to use this on Sunday. The only time I've had people have issues, is either when they are trying it from a phone, or when there are a lot of people trying to download it at once. The best is to do it from a PC. If you are having problems printing, try downloading and printing from the computer. Let me know if you have any other problems. Thanks! this is so amazing...thank you sooo much! Thank you for saving me this week! I have lurked on here many a week, but I'll be moving soon and thus (perhaps) changing callings, so it's time to come out of the shadows. I do a Google search each week I need to prepare a sharing time lesson and inevitably end up back here on your site. The way you teach resonates with me; it's not too flashy, but it's engaging. You make it easy to facilitate deeper discussions with senior primary. I teach middle school, and your lessons are the ones that I like the most. Thank you SO much for sharing all of these resources for free! Thank you so much for your comment!! I am so glad that the lessons have help bring some engagement with your primary :) It's always my hope when planning them that they will help the children truly understand the doctrine and be able to apply it into their own lives. Best wishes with whatever your move will bring you! :) Thanks! !